IPv6 router advertisements messages contain router lifetime field (measured in seconds). Using a one-second lifetime might be questionable due to host IPv6 stack implementation details, but two seconds should be a very reasonable value. Ignoring for the moment the fact that very short RA interval burns CPU cycles on every host attached to the IPv6 subnet (which is OK in campus networks where users don’t know what to do with 8 cores in their laptops anyway, but maybe not in a large server subnet), there’s another gotcha: IPv6 forwarding across MLAG-enabled switches. Imagine two layer-3 switches in an MLAG group (example: Cisco’s VPC). Even though these two switches appear as a single entity to LACP neighbors, they still have independent MAC addresses and IPv6 link-local addresses. 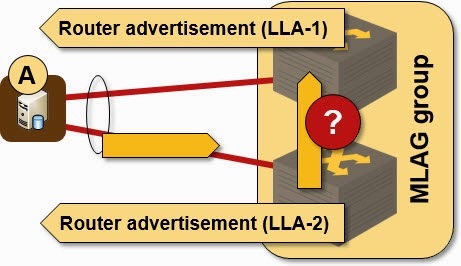 Each switch advertises itself using its IPv6 LLA, and the hosts in the attached subnet choose one or both of them as the first-hop router… but both IPv6 LLA appear to be reachable over the same LAG to attached hosts or layer-2 switches. Off-link traffic sent to one or the other router (layer-3 switch) will thus take any one of the uplinks (based on the packet’s ECMP hash value) and will land at the wrong switch half of the time, resulting in overloaded inter-switch link (best case) or dropped traffic (worst case). To make IPv6 work across layer-3 switches configured as an MLAG group you have to use the same tricks you did with IPv4: virtual ARP on Arista EOS (it works with IPv4 and IPv6) or active-active VRRP or HSRP on most other platforms. My IPv6 high availability presentation is part of the IPv6 Security Summit @ Troopers 2014. You can also register for the IPv6 High Availability Strategies webinar. Not to mention you can't bind tracking to IPv6 RA. WIth HSRP you can do a failover while tracking another interface, or route, or IP SLA. So I consider it a poor man's HA. Would/could IPv6 solve some of the HA scenarios by providing two different IPs, in different A/B nets? Hosts IP stacks are used to have multiple IPs in v6 world anyway? I'm not sure you want to open that can of worms ;) Search for "IPv6 multihoming without BGP"
Yeah, that happens when you start answering questions before doing some background check first ;) At least I was somewhat consistent. Thanks for pointing this out, will cross-link the two posts. So there is apparently way to make this work without 2s lifetime RAs - if you set the AdvValidLifetime and AdvPreferredLifetime fields for the deprecated prefix to zero then the route will be withdrawn from users. Courtesy of a discussion on the AusNOG list. That works for prefix failover or renumbering, but not for router failure detection. Ahh. The above arose from a discussion on multihomed IPv6 networks without BGP or NAT, so yes, a different scenario.